When it’s time to replace your old wood windows, your choice of material will be a very important decision. While there is no right or wrong answer, some options simply provide more advantages over others. 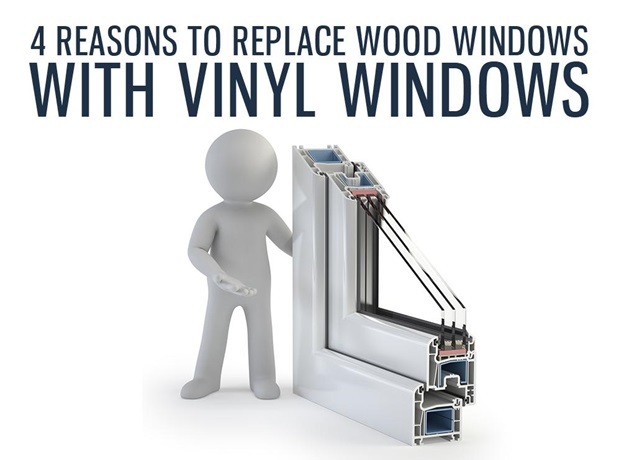 For instance, if you still plan to use wood for your window replacement, you might start looking at the benefits of vinyl windows. 1. Low Maintenance Composition – Wood windows require repainting every few years to keep them in the best condition. This could be tedious work, as you need to be extra careful to avoid painting over moving parts. Vinyl windows, on the other hand, don’t need additional painting and sealing to keep them in prime condition. They can withstand even the harshest winters and never succumb to the elements. 2. Advanced Glass – If you’re looking to minimize the damaging effects of UV rays on your furniture, vinyl windows are the perfect choice for your Detroit, MI, wood window replacement. Our options come with Low-E glass, an advanced package that significantly reduces the amount of harmful rays that penetrate your home. 3. Energy-Saving Frames – Our windows have insulated vinyl frames that can trap wanted energy inside your home. When you replace your wood windows with new vinyl units, you can expect an immediate decrease in your energy bills. This is because you no longer have to overuse your utility systems to keep your interior comfortable. 4. Attractive Finishes – Although the standard color for vinyl windows is white, you are not limited to this color alone. For your wood window replacement in Detroit, Michigan, Kroll Construction provides vinyl windows that come in a wide range of colors and finishes. With the help of our design specialists, you can find the right color for your needs. Investing in new windows can be a difficult decision to make, since you have many options to consider. However, the more you know about our vinyl windows, the easier it gets to make that decision. You can give us a call at (888) 338-6340 or complete our contact form to start reaping their benefits. Our experts will be happy to assist you.